Toshiba returns from the TV wilderness with its X97 OLED | What Hi-Fi? It's been a while since we've seen a new Toshiba television. The company has had difficulties since partnering with Vestel, and only last April posted a £3.8bn loss (no doubt spurred by a big hit after its 2015 accounts scandal). Toshiba even went so far as to say that there were "material events and conditions that raise substantial doubt about the company's ability to continue as a going concern." Nevertheless, the venerable Japanese brand is back - and looking to impress - with its first 4K OLED TV. The 65in X97 boasts 4K Netflix and YouTube support, as well as a "ScreenShare" function so you can stream video from your Android smartphone. There's also the option of connecting a 4K Blu-ray player or games console through one of its four HDMI ports. If you're a fan of high-octane movies with plenty of on-screen action, Toshiba is confident its MEMC (motion estimation/motion compensation) feature will be able to keep up. And, for gaming, it also claims a 'Game Mode' response time of less than 1ms. Making its debut alongside the X97 is the new U77 range of 4K LCD televisions - available in both 55in and 49in screen sizes - which shares many of the same features as the X97 line, including support for Netflix and YouTube. As well as those ranges are the "value-added" 4K U67 range - available in 65in, 55in, 49in or 43in - which also offer Netflix and YouTube support. Lower down the price scale are the Smart Series (from 24in to 55in) and Entry Series (from 24in to 49in) ranges with Full HD or HD Ready resolution (dependent on size). While the Smart Series range still has Netflix built in, the Entry Series doesn't - although there is a built-in DVD player on its 24in, 32in and 39in versions. 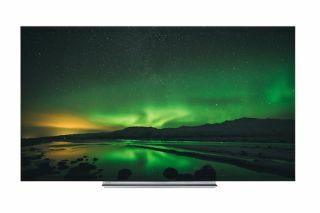 Toshiba says more innovations are coming next year, with the 2018 range of televisions adding support for HDR content, and Amazon Prime Video. There is no word yet on how much these new 2017 sets will cost - the estimates are that the OLED TV will be around the £4000 mark, while the U77 will start from around £600 - but we will update you with more specific information as soon as we have it.